The arms and ammunition market in Argentina has exhibited a robust growth in the recent past. as the increasing popularity of sports activities among such as hunting and shooting among tourists and the modernization of military equipment are the key growth drivers for the market growth. The competitive landscape includes market players supplying arms and ammunition to Argentina from all over the world. Factors, such as cost, innovation and development, and ease of accessibility have been significant for gaining growth in the arms and ammunition market in Argentina. Additionally, increased demand for small arms and ammunition for purposes such as hunting, sporting, and self-defense is expected to drive the growth of small arms and ammunition during the forecast period. 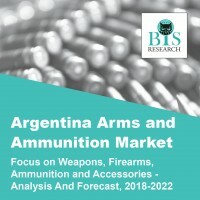 • This report identifies the arms and ammunition market in Argentina across different categories such as military weapons, revolvers and pistols, firearms and similar devices, spring/gas guns or pistols, parts and accessories for weapons, bombs and grenades, and small caliber ammunition. • The report mentions about key market players for each category of arms and ammunition imported in the Argentina market. • There is an additional focus on small caliber ammunition market. The report provides expected value and volume of imports for small caliber ammunition both by brand and caliber type during the forecast period. Arms and ammunition are used by different end users, such as military, law enforcement, and civilians based on their requirements. Ammunition in the civilian market has gained importance owing to the growing demand by tourists for hunting and shooting applications. Local manufacturers of arms and ammunition do not fulfil all the requirements for military use; hence, imports become an important factor driving the growth of the market in the country. The market landscape includes players from different geographies having global distribution networks along with domestic manufacturers. Factors such as cost, innovation and development, and ease of accessibility have been significant for the market growth of the domestic arms and ammunition in Argentina. Additionally, the decision taken by the government to modernize all military equipment is also expected to contribute toward a robust demand for military weapons and bombs and grenade categories of arms and ammunition in Argentina.